Items not collected/received by 27 Feb 2019 will be forfeited and no refund will be given. Simple elegance with a fun touch. Design A: 3 charms – Wink with Tongue, Cool Sunglasses & Tears of Joy. Design B: 3 charms – Tears of Joy (smiley), Tears of Joy (cat) & Huge Grin. Design A: 5 charms - In Love, Tears of Joy, Heart, Wink with Tongue & Kiss & Wink. Design B: 10 Charms - Huge Grin, Wink, Pile of Poop, Shocked, Tears of Joy, Heart, Kiss & Wink, In Love, Clenched Teeth, Cool Sunglasses. 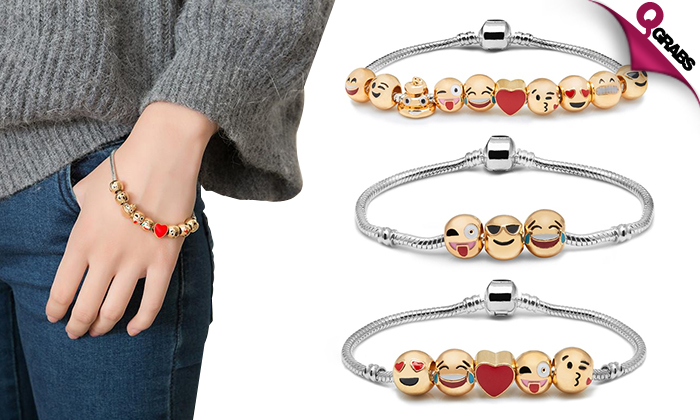 With up to 45% off, being emoji-expressive!